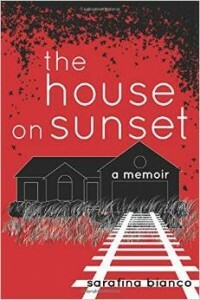 I am beyond grateful to have the opportunity to connect with Sarafina Bianco, author of The House on Sunset, which is her must-read memoir about her experience in an abusive relationship. I recently read Bianco’s story and was blown away by it. Domestic violence cuts across all cultures, classes and races and no one is immune to it. In her memoir, Bianco shares how easy it can be to slip into an abusive relationship, and how dangerous and impossible it can be to leave one. She draws you into her story and you will find yourself smack dab in the middle of the nightmare that is an abusive relationship. This book is a page turner, you will not want to put it down, and you will be horrified. She offers a voice for the voiceless, bringing out of the shadows a deadly epidemic that has long been hidden. Everyone should read this book. Domestic violence, also known as intimate partner violence, is a topic that I have purposefully not addressed much in my coaching practice, as I am by no means an expert in this area, despite my expertise working with relationships. In fact, I will not work with couples who are in classic abusive partnerships because the kind of work that I do would do them more harm than good. I help partners be vulnerable with each other to create stronger emotional bonds, but when there is a toxic dynamic of abuse that is present, any kind of vulnerability is actually life threatening. That being said, domestic violence is a serious, deadly and underrated problem. Domestic violence is the greatest cause of injury to women. There is a great deal of misunderstanding about Domestic Violence that exists – for more myths debunked, check out this article. I am so grateful to Sarafina for being here to share a little more with us about her journey and how she has managed to not only survive the horror and trauma that lies behind her, but thrive, and help other women do the same. Domestic violence starts insidiously, as we see with you and Mike, and most people don’t realize they are caught in an abusive relationship until it’s too late. Is there any advice that you can give our readers, from your own experience, about warning signs or indicators that they may be in an abusive partnership, and what to do about it? This question is so important, though the answer often feels defeatist. The key, I think, is to remember that abusers and sociopaths don’t come with labels. As someone who had to learn to date again, after leaving an abusive relationship, there were warning signs I looked for in potential partners. Looking for these signs in any partner, even if you haven’t been abused, can lead to safer, healthier dating for any woman. They are incredibly, often inexplicably kind and generous with their time, money and affection. If someone appears to be a dream come true, it’s not impossible that they are, but it’s a huge sign to be cautious, at least for a little while. If you would tell your friend to slow down (because her relationship is moving too fast), then you should absolutely heed your own advice. Easier to say than it is to do, but consider that your life, your safety and self-esteem, are on the line. Committing to yourself is far more important than committing to your partner, and if they’re really that into you, a little distance won’t stop them from pursuing the relationship. If they make excuses for why they can’t (or won’t) be around for activities that include your friends, family or work, this should also be considered a warning. Why, if they are so devoted to you otherwise, won’t they meet the people in your life who matter most? Most often, it’s because they know these people are threats to their control. They’ll begin alienating you from your strongest relationships first. An example of this would be asking you to skip dinner with your family for the second week in a row, because you can always go the next week, and your partner really wants to make you dinner at home. “It’s now big deal,” they might say, “but I just want to have you all to myself tonight.” If you find yourself in a relationship that has torn you away from the people in your life who make you feel the strongest, you should absolutely question why your partner feels intimidated, or uncomfortable, and is cutting your ties for you (even if they do it in a way that makes it seem unintentional). Your partner often talks about the future, including you, but only talks about how their success or plan will get you both there. “I’m going to buy this house for us when xyz happens” or “I will take care of you by earning more money” without little consideration or acknowledgement of your dream. This feels, again, like a fantasy to a lot of women, but it’s an early indication that your mate isn’t acknowledging your dreams or hard work. Your independence. They are creating an environment where you are dependent upon them, and this can also be considered a huge red flag. You clearly came close to death at several points throughout your memoir, and likely more times in your relationship as well. How were you able to escape that? What helped you? Staying in an abusive relationship basically boils down to safety. Most women, though they know they are being abused, feel their life is less threatened by staying with an abuser than it is by leaving them. I am no different. There are studies that show most deaths in abusive relationships come after leaving an abuser, and so staying meant I could keep my life. But on that hot July morning, when he threw me down a flight of stairs and choked me at the bottom, I watched my blood pool on the ground and knew that he would, eventually, kill me if I stayed. The choice became obvious: stay and watch yourself die slowly or leave and fight. This, obviously, isn’t everyone’s story. And it’s pretty simplified. Still, when you’re staring down the barrel of a gun, you have to make a choice. Mine meant I kept my life. But I’m not blind to the fact that I’m lucky. What made you decide to write about your experience? How were able to be so strong and write this? For me, writing has always been a way to heal. I was notorious for scathing notes in high school, writing my friends when they’d done something to cross me. More often than not, I was better able to articulate my emotions by writing them out than I was speaking them. The Italian in me would often take over, and I became all flailing hands and profane language. Before I found counseling services, writing was my only outlet. I felt alienated from the people in my life, alone in ways I didn’t know were real. So, every Sunday, I gave myself one hour of time to vent about living after abuse: the difficulties with hiding how hard recovery was, and the nightmares that reminded me how different my life had become. But I would have never, and I mean that 100%, never been able to write The House on Sunset without having gone through three very hard, very long years of trauma therapy at a local non-profit for survivors of domestic violence. There, I dealt with my PTSD and Body Dysmorphic Disorder. I learned the warning signs of abuse, my personal beliefs that might have made it easier to overlook Mike’s flaws, and I learned how normal abuse survivors are. Through my group therapy experiences, the ignorant assumptions I had about survivors were thrown in my face, teaching me that we all just wanted to help. Our strength was our worst enemy, unfortunately. The women who struggled with DV but didn’t have an outlet like mine, inspired me to share my story and, in some ways, show the pieces of a survivor that live in all of us: the strength, the courage and the heartbreak. It wasn’t easy. I forced myself to stop writing at any sign of being re-triggered. And, sometimes, that meant I didn’t write for weeks at a time. But I knew I owed it to myself to open the blinds on a part of my life that was hidden, and I knew it would help somebody. It didn’t seem like an option after I started. Have you changed at all as a result of writing and sharing your experience? Yes. Releasing my story made it certain that my journey in advocacy wasn’t over. For a while I thought that writing the book would be the end for me, the close of a chapter in my life that was horrific. In actuality, writing my book made me realize how fortunate I am to have become the person on the other side of that disaster. I’m stronger, more motivated and loving, and I’m definitely more empathetic than I was before the abuse. These are gifts, in my mind: a way the universe repaid me for the suffering. Instead of looking at what happened as a negative, I now see the silver lining. Sure, what happened shouldn’t happen to anyone and it was unfair, but – for me – saying that over again won’t change it. And that’s what I want to happen: to change the way the world looks at domestic violence, and to stop the epidemic that kills every day.This, of course, also comes from my place in the healing journey. Every survivor will feel very differently about what I’ve said here. Some may take offense to my position, and I hope they don’t feel judged. Where ever each of you are on your journey is okay. Maybe you’ll never feel what I do, and that’s perfectly okay too. But this is what abuse has done to my life, and I’ve learned – more than anything – that I need to be 100% honest about my experience in order to overcome it. This is just another aspect. Can you share with us a glimpse of what has happened for you since you’ve published your book? After I learned to avoid stalking my stats on CreateSpace and KDP, I focused more on spreading my word. I’ve given away over 3,000 copies of The House on Sunset and spoken in front of 500+ people at a local non-profit’s fundraising gala. I’m trying to build a life for myself inside of the field of advocacy, and I’m weighing my options right now. You are now married and in a healthy & supportive relationship – how does that affect your life now? My husband is a damn good man, and our relationship has proven to me, in many ways, that life will remind you almost all feelings don’t last forever. Before him I’d sworn off dating for three years. I was scared and failed the few times I actually tried to date after leaving Mike. So, for me, it was much easier to hide away than it was to continue down a path that lead to fear and rejection. And then this man came into my life who threw my belief on its head. I told him early on about my past, my apprehension, and I told him I wouldn’t date him. That we could be friends and hang out in public places, but that was it. He respected my boundaries. After a few months like this, his random absences became earthquakes in my life. That’s when I decided I was ready to try. “We’ve got this,” and “I’ve got you,” became his mantras. I’d panic sometimes. Every time he looked at me like a whole person, I felt a little more whole. Can you tell us about your work now? Do I want to help other women write their own stories? Do I want to speak more? How can I best utilize my gifts to ignite necessary societal conversations? I’m not sure, but I’m working on it. In my “other” life I work as a ghostwriter, editor and writing coach, and I’m looking for ways to meld Fina, my pseudonym, with my real life. 2015 brings with it a revolution. If anyone is interested in following along (or participating), you can find me on Facebook and Twitter. Every Monday night (9pm EST) I host a Twitter chat for survivors called #domesticviolencechat. We talk about life after abuse, healing and finding resources that help us. New voices are always welcome. Can you say anything about how a strong and healthy relationship impacts your ability to do your work in the world? As someone who had the exact opposite for almost five years (the relationship and the aftermath), and now has a successful, loving relationship, I cannot begin to explain how significant this is. Relationship problems fester in all areas of your life: your self-esteem, your happiness and independence, and certainly then percolate in your career. I stuck with a career in teaching for my entire recovery process, because I knew I was good at it and I didn’t want to have to think so hard at work…I was thinking too hard everywhere else. Then, after I got my relationship in order and learned how to love again, I was better able to listen to my intuition. I left teaching, wrote my book and started working full time as a ghostwriter and editor. I’ve seen so many entrepreneurs struggle while their partner disagrees with how they’re running their business or pursuing their dream. And it can truly take a toll on how much work they’re producing and how they believe in themselves. Having a partner who supports you through your work journey, just as they do in other aspects of your life, is key to success. Do you have any advice for women who aren’t as far along as you are in the healing process following abuse? What words of wisdom do you have for them? Some people find it through writing, while others are better able to heal through therapy. Most survivors don’t realize there are non-profits that offer free trauma therapy to them, if they set up an appointment to get help. You do not have to provide police reports or documentation, but you do have to show up. I received individual therapy for three years, plus attended many group sessions. In group, we were better able to explore healing options: like education, art and music. At the time of leaving my abuser, there was no way in hell I could have afforded these services. That’s why finding a non-profit is so important. How fortunate you are, Fina, to be alive to share this story! Congratulations to you on your work, your marriage, and your continued healing. Bless. And thank you, Jenev, for providing the space for this lesson and for your work with couples! Thanks so much for your comment, Lynn! I am so grateful to Sarafina for the opportunity to share her work.